Far too many Christians continue to live sickly, poor, and powerless lives, unaware of their rights, which are spelled out in Scripture and available to all believers. You can achieve great things for God by becoming a miracle?minded believer and claiming the promises of faith! 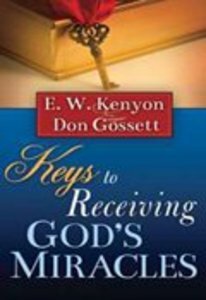 About "Keys to Receiving God's Miracles"
Kenyon studied at Amsterdam Academy, and at the age of nineteen, preached his first sermon in the Methodist church there. He worked his way through school, attending various schools in New Hampshire as well as Emerson College of Oratory in Boston, Massachusetts. Kenyon served as pastor of several churches in the New England states. At the age of thirty, he founded and was president of Bethel Bible Institute in Spencer, Massachusetts.